Federal budgeting can be very confusing at times. But at its core, it is very simple arithmetic. As in 'addition and subtraction'. No advanced calculus required, ring theory or Boolean algebra. Just 1+1=2. Or preferably if you are a spending budget hawk: 100-50=50 as in 'reduce many federal programs by 50%...and hardly anyone would know the difference'. 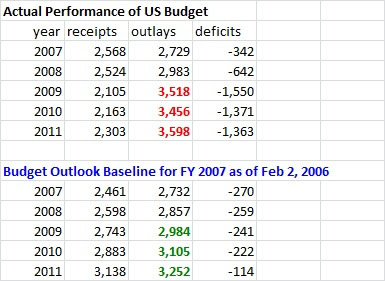 As of the year 2006, the projections for federal spending (bottom chart titled 'Budget Outlook Baseline') for the next year, FY 2007 and the next five years looked 'pretty normal': 4.4% growth one year; 4.2% the next..somewhere in the 4%-4.7% vicinity for as far as the eye could see. 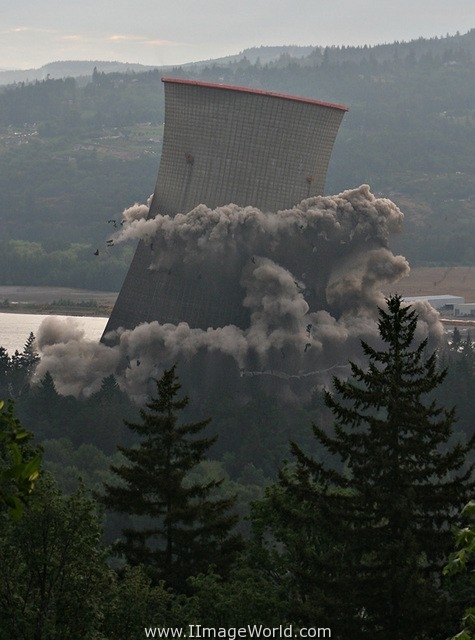 Well, 2008 comes around and the banking system melts down like Three Mile Island or Chernobyl. All hell breaks loose and in 2009, President Obama and the Democratic Congress pass their stimulus bills and federal spending leaps $534 billion to $3.518 trillion in just one year. A whopping 18% increase in one single fiscal year. Truth be told, some of this bailout expense started under President Bush in the fall of 2008 before President Obama took office but Nancy Pelosi was Speaker of the House and Harry Reid was Senate Majority Leader. Had the Republicans stayed in control of Congress, much of this initial outlay may have been about the same amount of money. But would it have stayed as high for this long? Typically, 'stimulus bills' are passed in a year with the hopes they will work and then they evaporate so the baseline could return to its normal trajectory. Well, we have had an amazing amount of stimulus spending that simply has not worked to reinvigorate the economy and stimulate the creation of millions of jobs that typically happen coming out of a recession, deep or shallow...and the high increased level of federal spending hasn't 'evaporated' yet to allow the baseline to fall back to its normal trajectory, has it? It means that we have not returned to the baseline projections of 2006 yet and probably won't for quite some time, if ever. The baseline took a sharp 11% stair-step up in 2009.....and has stayed there for the last two years. That is a $1.231 trillion accumulated hike in the underlying baseline that will probably never be allowed to go back down to the normalized baseline of 2006. Because all of these programs are now deeply embedded into the American governmental structure. As we all know, NO federal program ever gets eliminated once it is put into place. NO federal program ever suffers an absolute real cut from this year's levels because of baseline budgeting (which always projects an overall increase of at least the expected inflation rate plus 1%-2% in future overall growth in federal spending). This time, the crisis of 2009 helped ramp up overall federal spending to a much higher baseline level than before...and no one is talking about it right now. Our tax receipts will never catch up to the rate of growth in spending until spending growth is held below the rate of inflation for at least 5 years running. That is what the next President can help achieve. Even if he just pushes the veto button on his desk on every spending bill that gets there from Congress. Who do you think will do that....President Obama (who has vetoed only 2 bills total in 4 years in office, second fewest in American history behind only James Garfield who served for only 200 days in 1881 before his assassination) or Mitt Romney who vetoed at least 800 bills during his four years as Governor of Massachusetts? "Government's view of the economy could be summed up in a few short phrases: If it moves, tax it. If it keeps moving, regulate it. And if it stops moving, subsidize it"
Well said, life is the most beautiful thing that any human being would like to concentrate on. But are you sure is immortality possible or not. Because immortal is something that is uncertain.